There is nothing quite like sharing a homemade Sunday Lunch with a loved one. 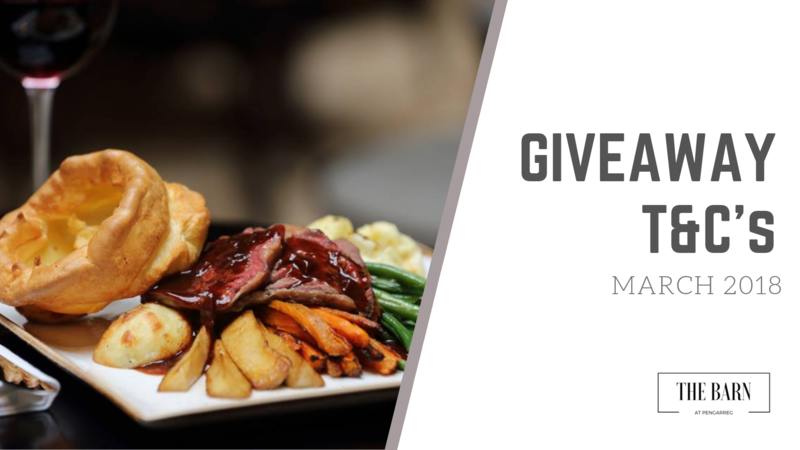 To celebrate the re-opening of The Barn and the beginning of our season, we are giving away a Sunday Carvery for 2 with a bottle of wine. Head over to our Facebook page to enter our Giveaway! 1. This promotion is offered by The Barn, Pengarreg Caravan Park, Llanrhystud, Ceredigion, SY23 5DJ. 2. The promotion starts on 04/03/18 and ends at midnight on 31/03/18. 3. Users who “like” the Facebook account “The Barn at Pengarreg”, share the original promotional post, and comment will be eligible – providing they are UK residents aged 18 or over. 4. The winner will be announced no later than 1 day after the competition ends. 5. The prize is non-transferable, not for sale/re-sale or redeemable for cash. The prize must be claimed in the 2018 season. 6. The winner will be announced on our Facebook page and notified via direct message. 7. The winner’s name will be displayed on our Social Media pages. 8. If the winner cannot be contacted or does not respond within 48 hours of the initial notification, or cannot take up the prize, then the promoter reserves the right to withdraw prize entitlement and/or select another winner who meets the criteria set out above.